This 100% cotton T-shirt is available in white. 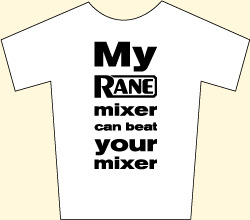 The back reads "My Rane mixer can beat your mixer" - back of the t-shirt. The front has a small Rane logo and a TTM 56-style crossfader graphic.